Amitav Ghosh described this book as "Enormously ambitious but thoroughly readable", and I'd have to agree on both counts; however, the book did not quite live up to my expectations. This may simply be a disservice which the hype that has surrounded this book (and the burnish added by Mishra's run in with Niall Ferguson) had inevitably incubated. In many respects, though, I think it is too ambitious not to have a few flaws and failings, but in taking a particular analytical approach with the intention of opening up discussion the book certainly serves its purpose. And, perhaps, with time and more thought (I hope) Mishra may well refine his work to better meet his ambition. The book was useful to me in tying together certain thoughts on the connections, parallels, and differences between the disparate regions of Asia during the era of Western colonial incursion (as experienced by the Ottomans, China, & India, and the somewhat incongruous exception of Japan - which perhaps could have done with more analysis). I found the unusual presentation-style of such a scholarly book rather odd though (especially the lengthy 'bibliographic essay' in place of more detailed notes and traditional bibliography); and I couldn't help feeling it rather boldly hints at a widely read and fiercely intelligent mind which has little patience - perhaps wanting to express his ideas as quickly and in as unhindered a manner as possible - and, in that sense, I felt the author let his own work down, because as such the book becomes simply a sweeping overview or general introduction to a very broad academic perspective which others will have to better elucidate or pick-apart in perhaps smaller and more point-focussed studies (but, then again, maybe that's his intention?). And, to be fair, he does admit that in pursuing his "impudent forays" : "I was more than aware that I was breaching disciplinary boundaries and academic protocols." ... In reading the somewhat mixed reviews of this book which I've come across he certainly seems to have succeeded in stirring debate. Not as great a read as I'd hoped, but still it's a leaping trans-disciplinary mix which offers plenty of food for thought and many ideas for further development. Well worth the reading thereof. Listen to Pankaj Mishra in conversation with Jeffrey Wasserstrom discussing "From the Ruins of Empire" and his 'exchange of views' with Niall Fergusson in this Sinica Podcast. See also, an interesting exchange of views contesting the extent of colonial assimilation and transculturation in 18th & 19th century India between Pankaj Mishra and William Dalrymple, focussing on the latter's White Mughals (2002) in 'Symposium: Imperial Trauma, Part 2: The Powerlessness of the Powerful' Vol. 11, No. 3, (2005). 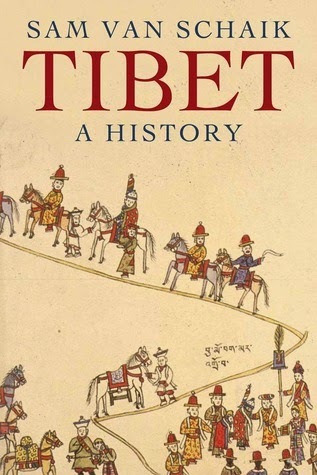 This book is an excellent introduction to the complex and often contentious history of Tibet. It manages to convey an admirably balanced overview (especially of the recent past). As a concise narrative history it is informed by a very clear, scholarly interpretation of its source material, yet at the same time it remains a highly engaging read. The chapters are set out in a clear and logical chronology with a deft lightness of touch in terms of occasional references linking either forwards or backwards in time to help the reader remain orientated without getting bogged down at all. Each chapter is then broken up into short sections which make reading such a vast topic surprisingly digestible. Van Schaik's commendably clear writing style also makes this book progressively absorbing. The book explains well how, until the intervention of Europeans and the subsequent global shift towards set ideas and ideals of rigid 'nationalisms', the political landscape of Central Asia was very much defined by shifting, fluid boundaries - based on fragile alliances and fealties, or outright conquest and subjugation - rather than fixed territorial demarcations as different polities rose and receded from prominence over time. Arguably these historical fluctuations have since been both the basis and the cause of various contentious attempts to settle and fix these polities in the modern era. In this sense Tibet has always found itself at the centre of a politically charged and highly contested chessboard of empires and nations. Historians will no doubt wish that the notes and references section had been given more depth and space, yet given the vast scope of this history the author has realised a truly commendable achievement in writing such an accessible yet simultaneously thorough text. Such a book has been long overdue, and, as such, this history will now undoubtedly serve lay-readers and students alike as *the* primary introduction for both those readers either interested in a general overview, or those wishing to embark upon a more in-depth study of Tibet's fascinating story. I highly recommend it! edited by Denise M. Glover, Stevan Harrell, Charles F. McKhann, Margaret Byrne Swain. 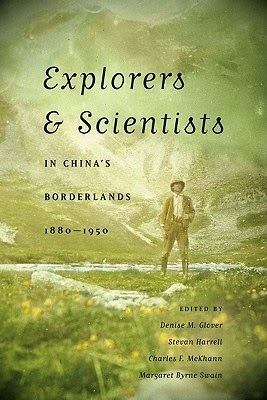 This book is a collection of eight essays, or “portraits”, each looking at different individuals who for various reasons all found themselves pursuing scientific studies in the borderland regions of southwest China at a time of great change. These individuals were often white Western males, and their hobbies and occupations frequently managed to merge a spectrum of roles: explorer, scientist, missionary, diplomat, photographer, travel writer. They were all imperial adventurers of one kind or another, each exploiting the fragmentation which accompanied the fall of the Qing, China’s last imperial dynasty, and the subsequent political struggles of the emerging Republican era. These were tumultuous times, yet all of these individuals – according to this book’s collective assertion – were ‘modernists’, each of them pursuing their separate scientific endeavours firmly fortified by their faith in human progress. The weakened fringes of the Chinese empire were the perfect place for such individuals seeking to push the boundaries of human knowledge whilst simultaneously filling in ‘the last blanks’ on the world map. The book is the result of an academic symposium which in 2007 brought together a mixed group of scholars, researchers, and filmmakers, and as such, it presents a multi-disciplinary set of biographies which together examine the theme of ‘knowledge gathering and empire.’ The various papers collected in this book look at a range of individuals – some already well known to scholars, others less so – namely: Joseph Rock, David Crockett Graham, Ernest Henry Wilson, Reginald Farrer and George Forrest, Fritz and Hedwig Weiss, Paul Vial, Johan Gunnar Anderson and Ding Wenjiang. These were by no means the only scientific explorers operating in this area at this time, and consequently this book does not seek to give a broad overview of the many botanists, ethnographers, geologists, geographers, and archaeologists who travelled through the region, but rather it seeks to look at a handful of case studies. The book aims to examine questions such as – how objective and classificatory scientific aims rubbed along with religious and humanist ideals; why collecting and cataloguing took precedence over analysis and reflection. The book also looks at the posthumous reputations of these figures and how they have been perceived by subsequent generations within China – either helping to define China as a modern nation-state, or denounced during the upheaval of the Cultural Revolution, to today’s surprising rehabilitation and cultural commodification for an emerging national and international tourist trade. This is a highly nuanced book which gives a fascinating glimpse into a little known area of China’s history, its cultural and scientific interactions with Western Imperialism, and a set of remarkably resourceful and tirelessly committed adventurers – an area which deserves to be explored more fully – yet which is presented here in such a format that will appeal as much to the interested armchair explorer as it will to the specialist academic. 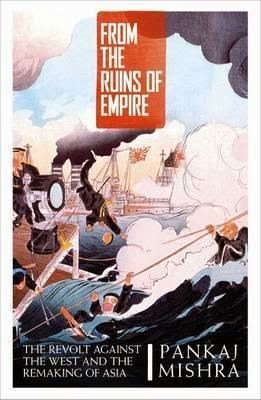 Covering a lot of ground in Asia, this book is a history of the oddly disparate British imperialist project as a whole, and as such it also covers Africa and the Americas - but I'm including it amongst these book reviews primarily because it presents Asia (particularly with India having been such a long-standing and integral part of the British Empire) from an interesting, globally-interconnected perspective which neatly dovetails with Pankaj Mishra's subaltern perspective in From the Ruins of Empire which began this set of reviews. For anyone with a general interest in the era of Western Imperialism this is a 'must-read' book. It provides an admirably balanced overview of the rise, eminence, and disintegration of the British Imperial system and is written in a clear and accessible, uncluttered style. 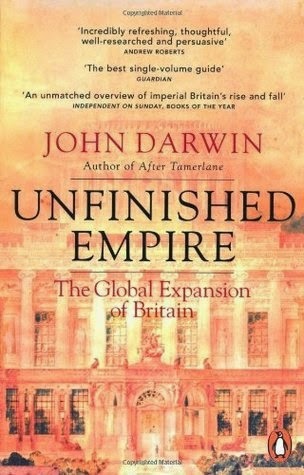 John Darwin, who currently seems to be at the height of his powers as a historian, examines the British Empire through a series of themed chapters, each looking at a different aspect of imperialist agency - highlighting the fact that there were in fact multiple means of conquering or establishing, and then exploiting, maintaining and administering, as well as eventually dissolving (or less frequently retaining) its imperial domains across the globe; whilst also remaining mindful of the fact that although the high days of the Empire are well and truly past, there are still British overseas territories in existence - hence the book's title. Similarly - and perhaps most importantly - the book doesn't shy away from examining the darker policies and incidents which characterised British rule in some regions, nor the post-colonial legacies of which still remain contentious and apparent in today's global geopolitical realities. Given the broad nature of its scope and the vast sweep of time which it covers, this relatively slim volume manages to convey a comprehensive, wholistic vision of what was a truly multifaceted entity in all its various and sometimes seemingly incongruous constituent parts, as well as what has been said and written about it by historians of different camps and different eras over time. For me personally, having the book arranged into such thematic chapters threw into stark relief which areas of imperialism interest me most and which tend to pass me by - so in that sense it was both an affirmation and an eye-opener, as I did find myself making profitable parallels and connections between areas which I might otherwise have neglected or overlooked entirely. In that sense this is a perfect introductory text for history students of whichever (political, economic, military, social, cultural, etc.) branch of the subject who might similarly wish to gain both a broader and more nuanced perspective. The excellent 'notes' and 'references for further reading' sections are good primers for readers wishing to launch off and explore a particular topic in greater depth. Plus, it shouldn't be overlooked that the book is generously scattered throughout with a series of fascinating illustrative maps which are well worth poring over and stopping to consider alongside the accompanying text (I imagine they would make great teaching aids as well). All round a very great book and a highly profitable read - one not to be missed!